To commemorate this event, the Zurich disciples of Sri Chinmoy organize a special concert in a Zurich church tonight playing and singing the music of Sri Chinmoy. 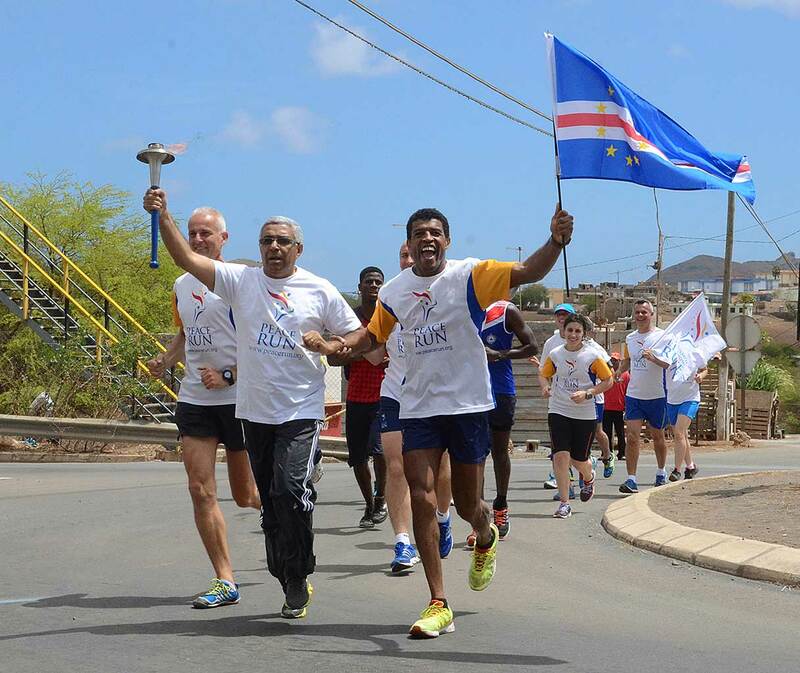 On March 27th, the international Sri Chinmoy Oneness-Home Peace Run finished their run in Cabo Verde. TCV also broadcasted an interview with Patrício Rodrigues from the Sri Chinmoy Marathon Team and famous runner Jorge Pina. 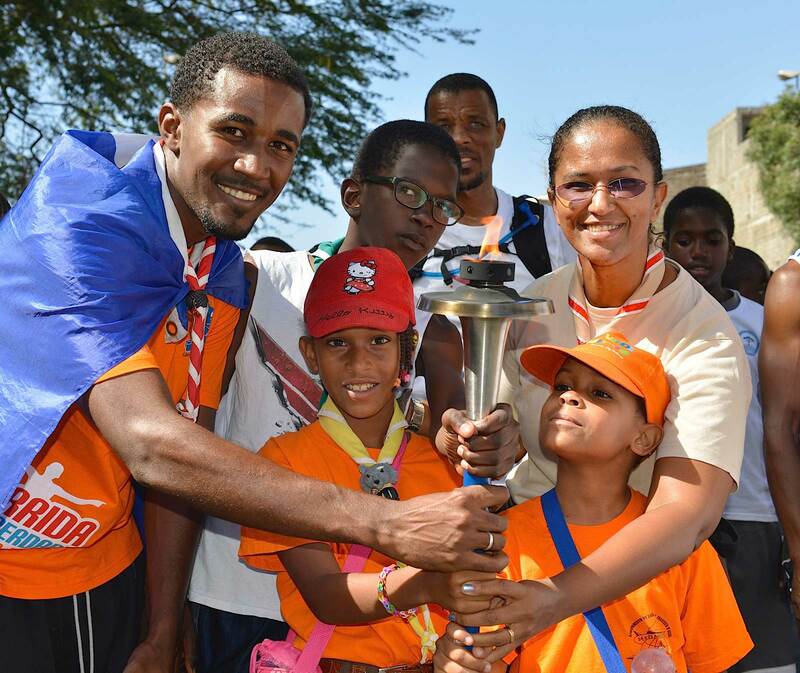 More pictures of the run on www.peacerun.org. 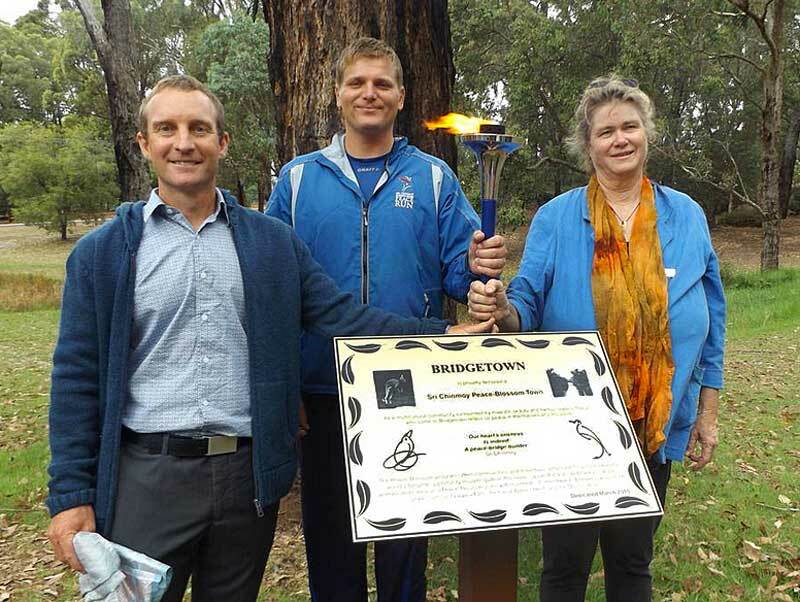 Five members of the Sri Chinmoy Centre attended the Pioneer Park on Saturday March 21 to dedicate Bridgetown, Australia, as a Peace-Blossom town. The Peace Blossom Programme was founded by humanitarian Sri Chinmoy as a way for people to express their support for world peace. “The peace-song is the only song that this world of ours has not yet been able to sing perfectly,” he once said. Hoping to inspire a solution, the growing Peace Blossom programme incorporates over 150 countries and 800 significant states, cities, natural wonders and man-man structures. To become a Peace-Blossom town, leaders declare their support and a plaque ceremony celebrating peace is held. The town then becomes part of a global network of Peace-Blossoms offering a daily reminder of the importance of inner and world peace. Councillor Julia Boyle gave an opening speech and the peace torch was lit and passed around, followed by a choir performance after the unveiling of the plaque. 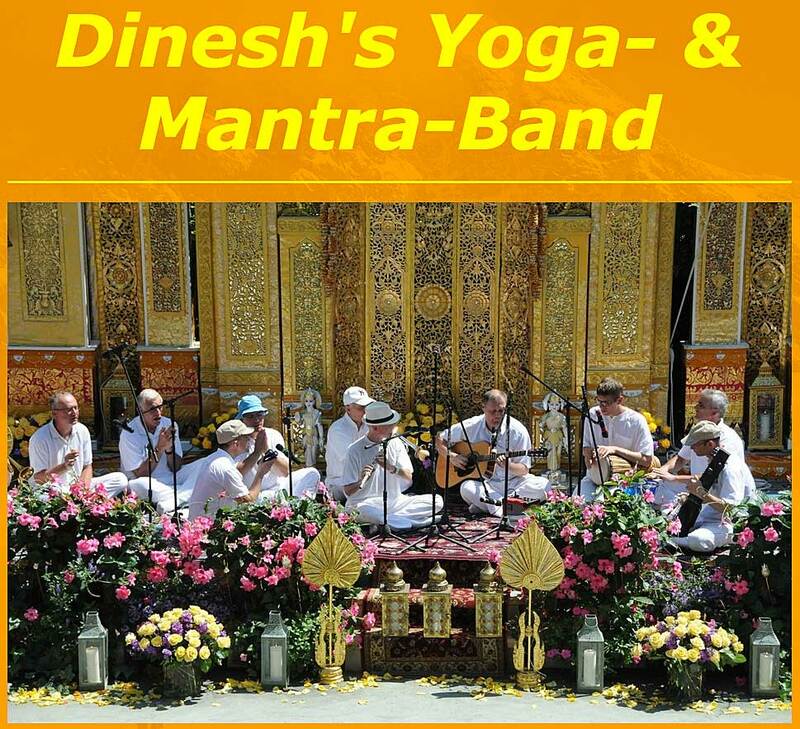 German disciple Dinesh, his brother Pramodan (both built many musical instruments for Sri Chinmoy) are joined by a group of international musicians, forming “Dinesh’s Yoga- and Mantra-Band”. They have now created their own website with many pictures of performances world-wide, concert posters and audio samples. You can check out the site here: dineshsband.de. If you are performing the music of Sri Chinmoy and also have a website, please let us know and we will gladly give the link to our blog readers. The DAIBUTSU, the great Buddha statue in Kamakura, Japan, is featured in this short video, one of the most popular films on my vimeo channel. Sri Chinmoy visited the site many times and even gave concerts at the foot of the monumental sculpture. I was also personally very moved when I stand in front of it the first time. By the way, Sri Chinmoy said that this statue represents the consciousness of the Buddha far better than all other statues worldwide. This video was also chosen as “Staff Pick” by vimeo. Enjoy! When Sri Chinmoy visited China in 2004/2005 he created a special series of paintings in the typical long vertical format. The session took place on January 1st, 2005 in Qingdao. Used colors were acrylics and the famous Chinese Black Ink. Enjoy the flow of creation, accompanied by traditional Chinese music. Length: 1:06 h. Filmed and edited by Kedar Misani, kedarvideo Switzerland. 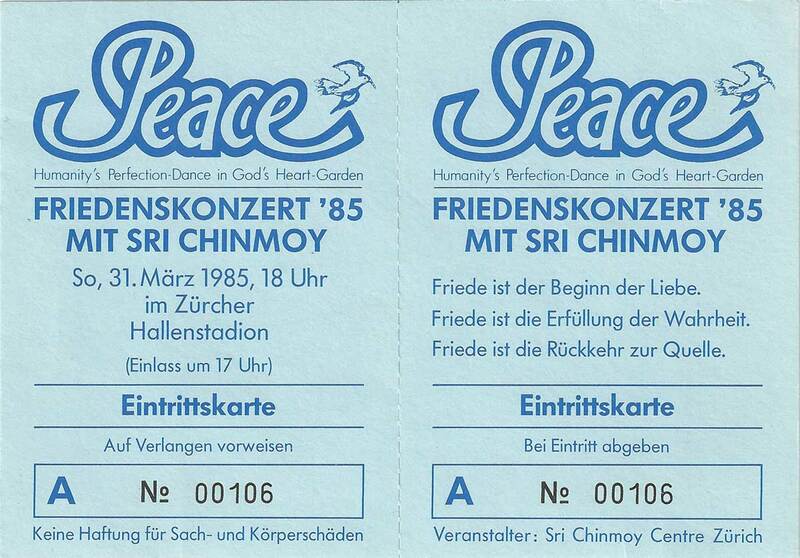 In 1989 Sri Chinmoy visited a monastery in Switzerland, where he prayed with the nuns and answered their questions about spirituality and religion. The Q&A is translated into German. It was a special and significant occasion to see that in the inner world all avatars are one. Length: 38:13 min. Filmed and edited by Kedar Misani, kedarvideo Switzerland. 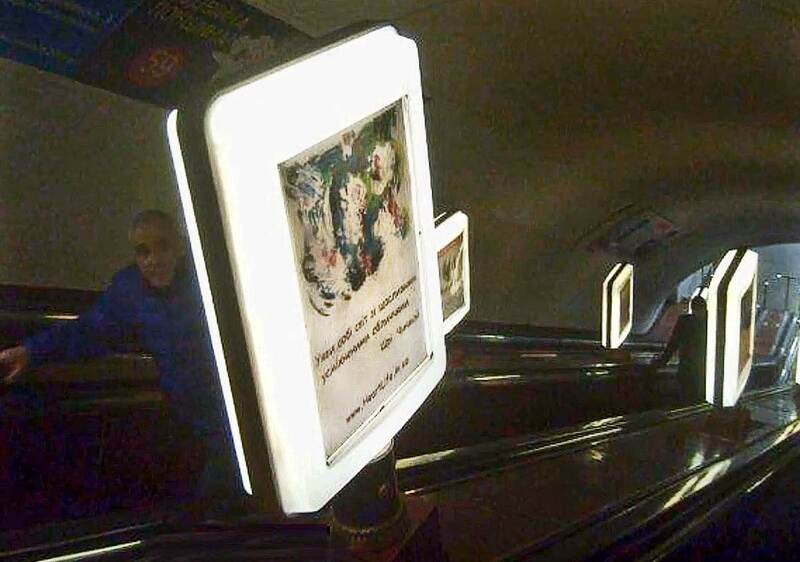 Sri Chinmoy’s aphorisms and artwork are currently on display on light boxes in various subway stations in Kiev. See also this video on youtube. “Songs of the Soul” is the title of an ongoing series of concerts to manifest the music of Sri Chinmoy worldwide. This concert took place in Dubrovnik, Croatia, early 2015. Disciples of Sri Chinmoy performed on various instruments and sang his songs. Included a.o. are Alap and Lukas from Zurich, Mandu and Visuddhi from Wels, the Czeck Angnikana’s Group (see cover picture) and Samita & Bhoiravi, Vienna. Filmed and edited by Kedar Misani, kedarvideo, Switzerland. UPDATE: The next “Songs of the Soul” concerts will take place in Kamakura on March 16, Kyoto on March 18, Tokyo on March 20, Nagano on March 21 (all Japan), Perth, Australia on May 2, then in Austria in Kärnten/Ossiach on May 17, Graz on May 18, Vienna on May 19, Linz on May 21, Salzburg on May 22 and Bad Ischl on May 24. 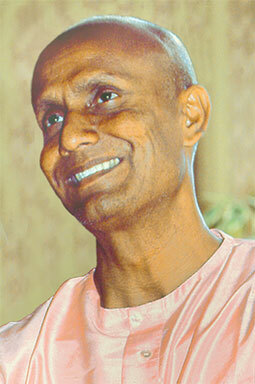 31 poems by Sri Chinmoy on the heart, recited by himself. In the second part of the video you will find excerpts of meditations, taken from kedarvideo’s meditation compilations. Enjoy!